The Perennial Plant Association has name Blue false indigo (Baptisia australis) as the 2010 Perennial Plant of the Year. 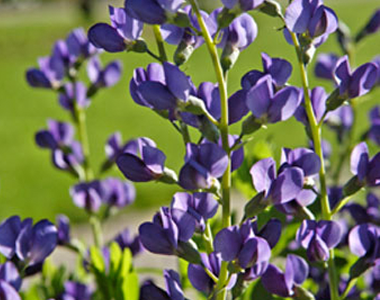 Blue false indigo grows three to four feet tall and three to four feet wide in an upright habit. This exceptional perennial grows across a wide range of zones and is one of the most adaptable native species. Newly emerging shoots produce violet-blue, lupine-like flowers in erect 10- to 12-inch racemes atop flower stems extending well above the foliage mound of clover-like, trifoliate, bluish-green leaves. The spring flowers are present for three to four weeks. The flowers give way to inflated seed pods which turn charcoal black when ripe and which flower arrangers consider to be ornamental. The common name, blue false indigo, refers to the use of this perennial by early Americans as a dye. Baptisia australis is an excellent plant to anchor the back of the border. It is also valuable for cottage gardens, native plant gardens, and native area of prairies and meadows. It is best as a specimen or planted in small groups. Blue false indigo can be used with bulbs and other spring flowering perennials to make interesting combinations. * Light – Plants thrive in full sun. Plants grown in partial shade may require staking. * Soil – This North American native is easily grown in well-drained soil and is drought tolerant after establishment. * Uses – This spring flowering shrub-like perennial may be used to fill the back of the border or in the wild garden. * Unique Qualities – The combination of flower and leaf color is dramatic in the early blooming season. Flowers are followed by inflated seed pods that are useful for dried flower arrangements.